Oskar Nedbal's ballet-pantomime, Princess Hyacinth, premiered in 1911 at the National Theatre, Prague, with libretto by Ladislav Novák. 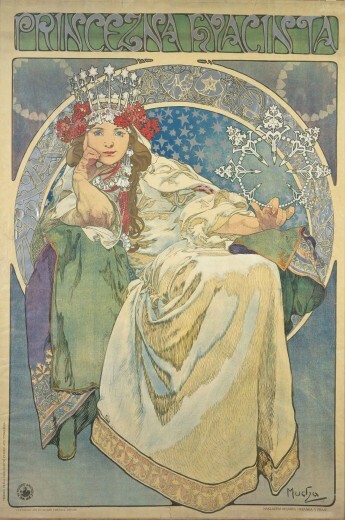 Mucha's poster advertising the performance features the portrait of the popular actress Andula Sedláčková, who starred in the title role. A village blacksmith dreams that his daughter becomes the Princess Hyacinth and that she is abducted by a sorcerer. Mucha makes reference to the plot by incorporating hearts, the blacksmith's tools, a crown and instruments of sorcery. A hyacinth motif is used throughout the decorative details.